Our first gig was the new Dave Holland project AZIZA at Conde Duque. 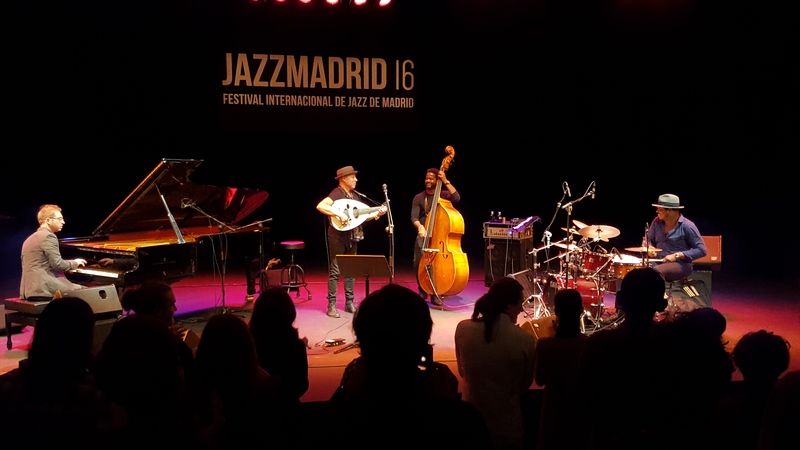 The band, featuring Chris Potter on tenor and soprano saxes, Lionel Loueke on guitar and Eric Harland on drums, just had released their first record, as well called AZIZA. And they opened the show the same way that great album does, with Loueke’s ‘Aziza Dance’, a groovy little number showcasing all the musicians as well as the groups fantastic interplay and understanding. 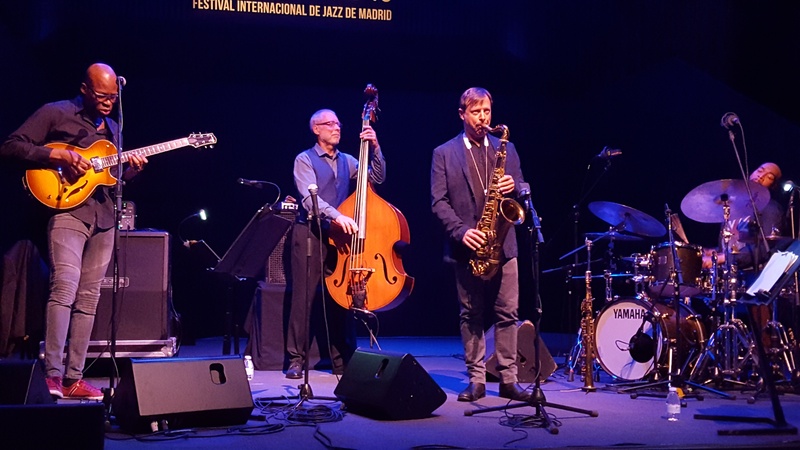 This band, these musicians, can go wherever they want – from swinging jazz to rock riffs and grooves, to freer explorations of a theme to beautiful ballads – and it all makes sense, as the artistry on display is just tremendous. Holland keeping the pulse going, Harland pushing the beats, changing accentuations, always keeping time perfectly and Potter and Loueke improvising jointly or individually on the highest level! Check out the album and if you get a chance to see these guys live, don’t miss it!! 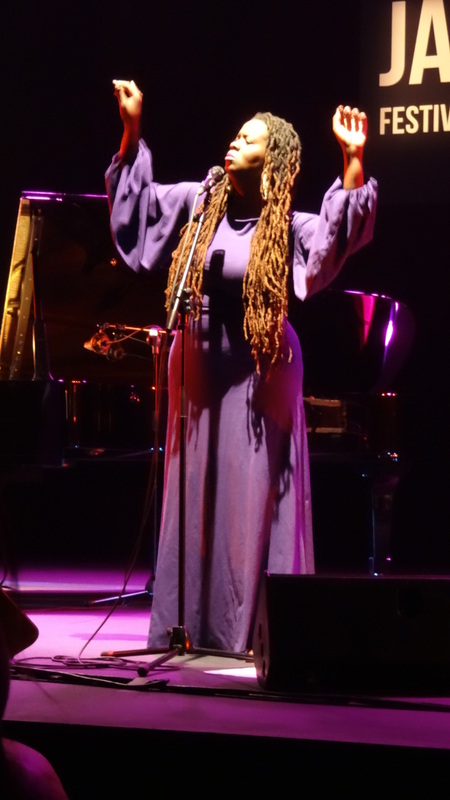 Somi opened her intimate show at the Teatro Fernán Gómez with a beautiful rendition of her own ‘Ankara Sunday’. Like this song, most of the performed music came from her ‘The Lagos Music Salon’ album, but she did, as well, sing a few new songs: ‘They are like Ghosts’ and ‘I remember Harlem (Like Dakar)’ did stand out as extremely beautiful and catchy. 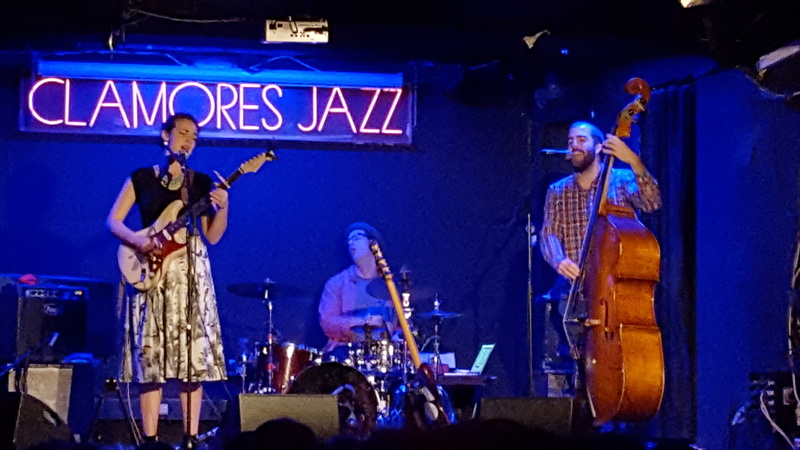 To perform just with piano and bass put the spotlight surely on her, but with her sublime vocal skills this was no problem at all – probably a benefit for the audience, as the intimate atmosphere got every listener deeper into the songs. Pianist Jerry Leonide supported Somi incredibly, filing spaces perfectly and bass player Michael Olatuja pushed when necessary and otherwise was the heartbeat to Somi’s soul. Outstanding, as well, their renditions of ‘Brown Round Things’ and ‘Last Song’. The standing ovation was more than deserved. The next gig we saw must surely count as one of the concerts of the year – the Dhafer Youssef Quartet delivered not only a powerful and spiritual show, but they managed to keep the listeners on their toes, holding attention and giving suspense, before grooving again – until the audience got up as one to dance. Simply incredible how Dhafer’s voice touched everyone, Aaron Parks on the piano played some beautiful soli based on Dhafer’s melodies, Ben Williams kept the odd rhythms going and put in some powerful bass soli and Justin Faulkner drummed as if his life was depending on it – with a smile on top of that incredible energy. This is a band of top players, having fun with complex music that still makes their audiences moving, dancing and screaming even more encouragement to the musicians … one gig to remember for a long time! Kristin Asbjørnsen has a voice that would fit a rock singer – slightly rough, but with immense control and power. Her latest records were based on songs from the Afro-American culture – gospels, work songs and spirituals and she does them surprisingly well for a small girl from Norway! Supported by guitarist Olav Torget and Gjermund Silset on bass, she did glide through these songs with ease and made them her own. A beautiful first concert for her in Madrid. Next on the list of shows was the ever amazing and surprising John Scofield. ‘Country for old man’ is the title of his latest release and was as well the program for this fantastic show. 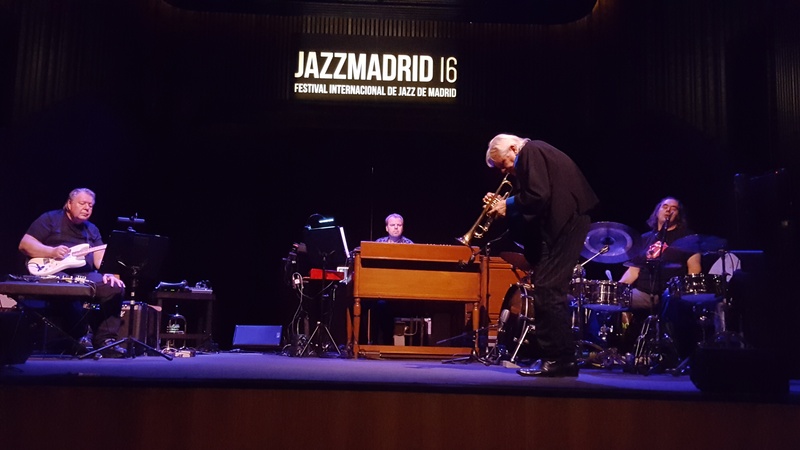 As usual John had assembled an amazing group to work with him – Larry Goldings on piano and Hammond organ, Steve Swallow on bass and Bill Stewart on drum. What else can you ask for? Outstanding in this collection of country songs were their versions of Shania Twain’s ‘You’re still the one’ and Jack Clements’s ‘Just a girl I used to know’, were Scofield’s soli were simply beyond: inventive, melodic and full of emotions. Goldings, when on the piano (my preferred instrument for him in that show), was subtle and beautiful and on organ powerful and seemingly having fun. Both Swallow and Stewart were at their best and John… whatever the base for his music – the music will become his. A group of masters at work. When Sly & Robbie, the veteran Jamaican rhythm group of drummer Sly Dunbar and bass player Robbie Shakespeare, meet up with Norwegian trumpet player Nils Petter Molvaer one thing is sure – the music grooves!!! Add to that mix the genius of guitar player and sound creator Eivind Aarset and the electronic percussion of Vladislav Delay and you get some truly cool music, groovy and beautiful, sometimes ambient, but with a steady pulse. Molvaer is such an interesting trumpet player with his little melodies and haunting sound. It was a perfect mix of musicians and ideas and the concert was extremely enjoyable, even so it was a bit too loudly mixed, which took away some of the fun. These guys are in the middle of recording an album together, which will be released next year – can’t wait to hear that. The next concert showcased 3 European jazz legends in one gig – Norwegian guitar hero Terje Rypdal, Danish trumpet player Palle Mikkelborg and Italian drummer Paolo Vinaccia – they added young keyboarder Rune Tylden to the mix and performed music from the ‘Skywards’ album from 1997 – and how fresh that music still sounded! Rypdal’s sound is so personal, longing and still kind of uplifting – easily recognisable since his early recordings in the 70s and Mikkelborg is one of the greats as a composer and trumpet player and he showed again why: from Miles influenced muted ballad playing to powerful moments he did it all in perfection – and Vinaccia powered all this energy from his drums, culminating in a fascinating solo over a dialog from the movie The Godfather (at least I think it was from that film). The keyboards filled the sound gaps, made the music complete and so it was really a concert to remember for a while. 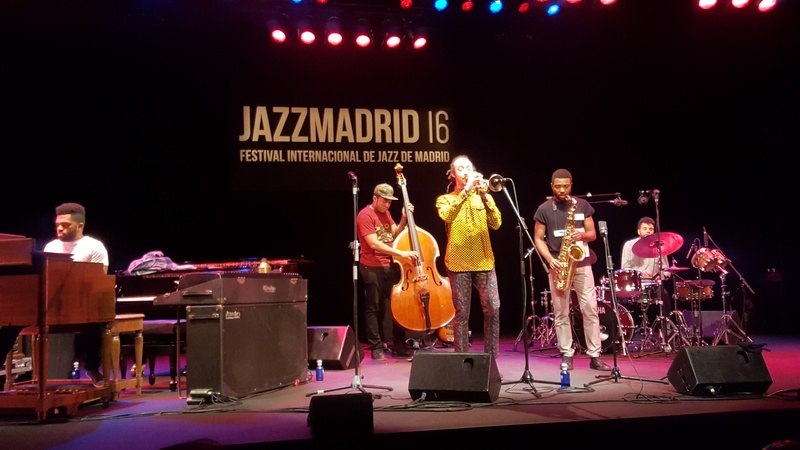 Theo Croker is a very talented young trumpet player and has a great band that feels at home in all kinds of music, as long as they can play it like jazz. 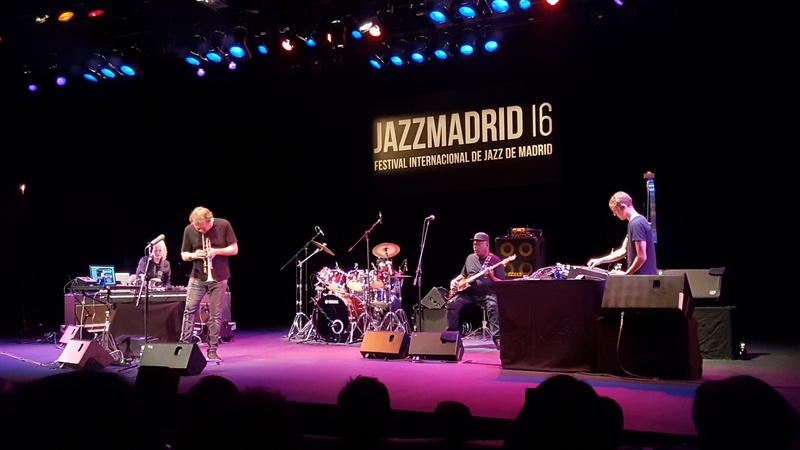 The show in Madrid consisted of material from his latest OKeh album ‘Escape Velocity’ and he did built up the concert beautifully, giving his band members space to show their skills, but maintaining an ensemble feel at the same time. Kassa Overall on drums, Michael King on keyboards, Anthony Ware on sax and Eric Wheeler on bass are a great band to play with and Theo seemingly had a great time on stage, as had the rest of the gang, enjoying the freedom of improvising on his compositions – a standing ovation at the end and a furiously great ‘Because of You’ as an encore made everyone going home with a smile. One for now and the future! As the reader of my little blog will know, I do like Madeleine Peyroux a lot, her way of phrasing and playing with the melody of a song. And I am a fan of the intimate format she has chosen to perform in lately, as I believe that guitarist Jon Herington and bass player Barak Mori are the perfect musicians for her and that format gives her space, as well as, focusing on her voice and singing. 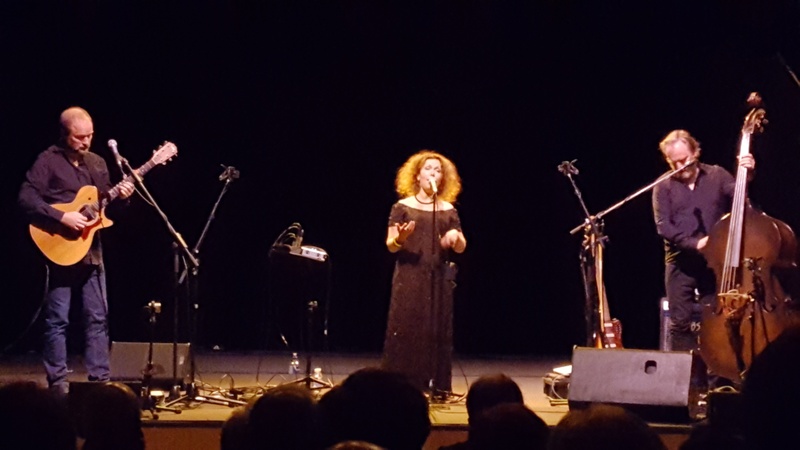 The repertoire of the concert in a full Teatro Fernán Gómez was based on her latest release ‘Secular Hymns’, recorded also with these two outstanding musicians, but included some of her previous well known covers and songs and a heartfelt version of ‘Bird on a wire’ as a tribute to the late Leonard Cohen. Madeleine and her two guys seemed to have fun on stage, she successfully made most of her announcements in Spanish, which the audience really appreciated. A unique artist on top of her form. Extremely enjoyable! 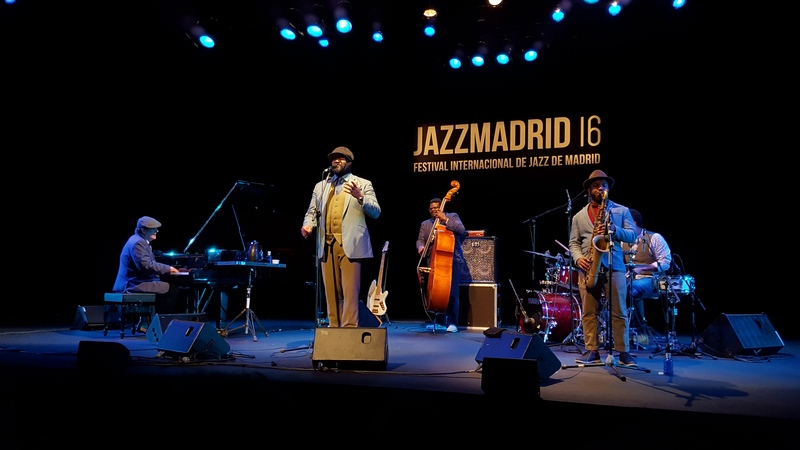 The last show of the festival for us came from the amazing Gregory Porter, performing the songs of his latest album ‘Take Me To The Alley’, but as well singing his previous hits like the gorgeous ‘Hey Laura’ and even going into a cool version of ‘Papa Was A Rolling Stone’. The band was very good, especially his longstanding pianist Chip Crawford was in great form, bassist Jahmal Nichols surprised with a reference to ‘Smoke on the water’ in his bass solo and sax player Tivon Pennicott and drummer Emanuel Harrold did also an amazing job. Gregory is such a huge personality, his voice and control of it is tremendous and his own songs are truly great – some people asked: Is this really Jazz? Who cares – it is great music, presented well, giving the audience a great time!! 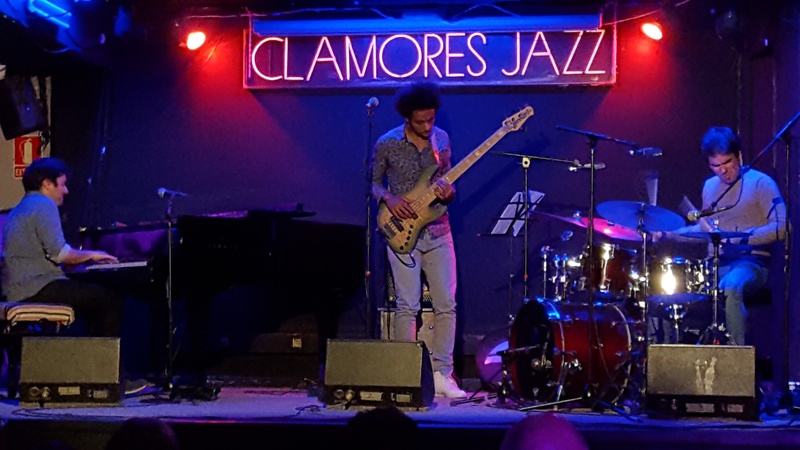 Then, outside of the Festival, I went to see Harold Lopez-Nussa – a young Cuban pianist who played with his trio in the Clamores Club in Madrid last Sunday, November 27th. I had heard some of his music before, but live I really enjoyed his melodic playing. His focus is on the essence of the song, using rhythms, but not having them overpower the melody. He played an absolutely beautiful solo piece as part of the show, which left the small, but dedicated, audience speechless. Definitely one player to watch for the future. But the last few weeks were not only about hearing great music, unfortunately they were as well about saying goodbye to some of the most important and influential musicians of our time – Mose Allison, Leon Russell, Leonard Cohen, Victor Bailey and Sharon Jones … may they all rest in peace. 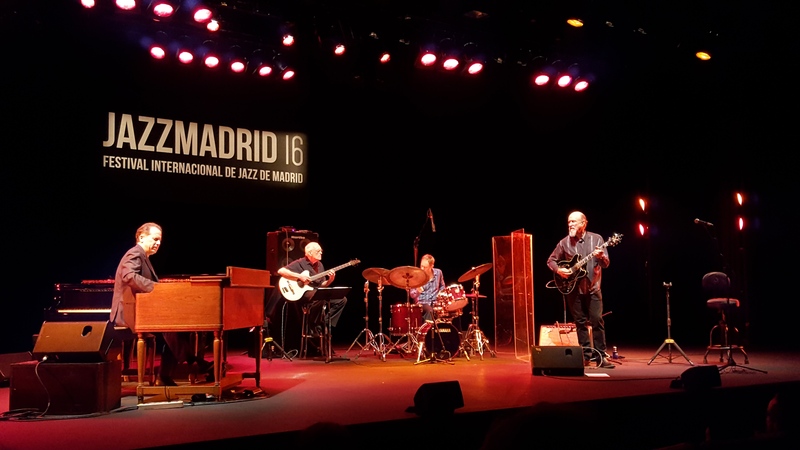 The autumn of music in Madrid started for me with the concert of the Bill Frisell group performing his latest album WHEN YOU WISH UPON A STAR on October 27th at the Auditorio Nacional. The program was based on the music of the record, with slight variations and focused therefore on movie and film themes. Petra Haden, the singer on the record and in the show, was unfortunately suffering from a cold and therefore kept her performance to 3 songs, which on the other hand gave Bill and his bass player Thomas Morgan and drummer Rudy Royston more space to explore the inner secrets of these compositions … and how they did! Bill’s beautiful explorative melodic lines, clear and captivating and full of twists and turns, kept the listeners attention, supported by his rhythm section perfectly. Especially in YOU ONLY LIVE TWICE the improvisations of the trio were amazing and a spectacular exchange of ideas from all 3 musicians. 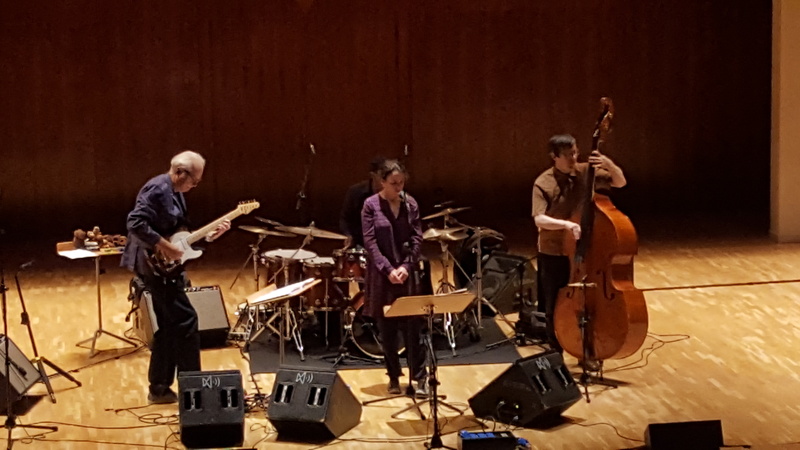 Whatever Frisell is taking on in terms of repertoire, he always is making it HIS – adding depth and personality to the music he performs. This show was no exception and another proof of that. Becca Stevens is for me one of the most interesting new singers and song writers and her show on November 1st at Clamores in Madrid simply confirmed that – just in a trio with her on vocals, guitar and other string instruments and with Chris Tordini on bass (with added backing vocals) and Jordan Perlson on drums, she did perform repertoire from her marvelous PERFECT ANIMAL album, as well as songs from her forthcoming new song cycle REGINA, which will be released in March next year. Becca is an amazing singer with perfect control of her voice and her writing is challenging and needs the listener to pay attention to capture the subtleties and beauty of her music and lyrics. I can’t wait to hear the new album and see her live again soon. From Norway there are a few great new releases to check out, lead by a wonderful compilation from Bugge Wesseltoft’s recording history of the last 20 years – SOMEWHERE IN BETWEEN is a collection of old, new and unreleased gems by the keyboard master and not only the perfect starting point if you are not yet a fan, but as well a great reminder how incredibly talented Bugge is in many ways. A must! MOST PERSONAL is a kind of best of by singer Rebekka Bakken taking the material from her Emarcy recordings .. and a few new tracks, ranging from a touching Norwegian folk song to one in German by the late singer/songwriter Ludwig Hirsch and three new songs in English – all worth listening to beside all the great songs from her 5 albums so far. A showcase for her great song writing and singing skills. Essential listening. Madeleine Peyroux’s SECULAR HYMNS shows her in a semi-live recording with the format I think works best for her – just accompanied by bass and guitar, with her on acoustic guitar and vocals .. Simplicity that gives focus to her amazing voice and phrasing …perfect. The choice of repertoire is great as well, ranging from Allen Toussaint via Tom Waits to Lynton Kwesi Johnson … amazing how she deals with these songs and creates that beautiful tight and personal atmosphere. Highly recommended. SPAIN FOREVER is the third cooperation of pianist Michel Camilo & Tomatito, the incredible flamenco guitar player from Spain. The repertoire here again is Spain based, but not exclusively and is definitely more laid back than on the previous 2 releases. Outstanding Charlie Haden’s OUR SPANISH LOVE SONG and GNOSSIENNE NO.1 by Erik Satie … and as on the previous releases there is a great version of a Chick Core tune, this time ARMANDO’S RHUMBA. Excellent! 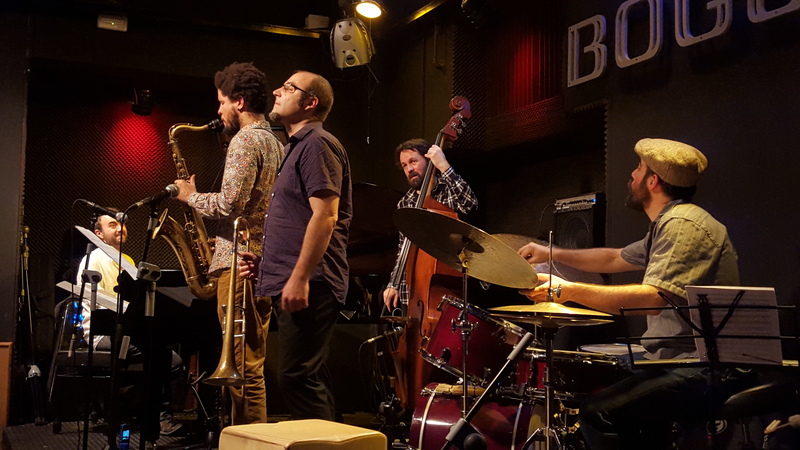 Composer, band leader and bass player Pablo Martin Caminero has just released his new group album SALTO A VACIO, featuring his usual working band with Ariel Bringuez on saxes, Toni Belenguer on trombone, Moises P. Sanchez on piano and Borja Barrueta on drums. 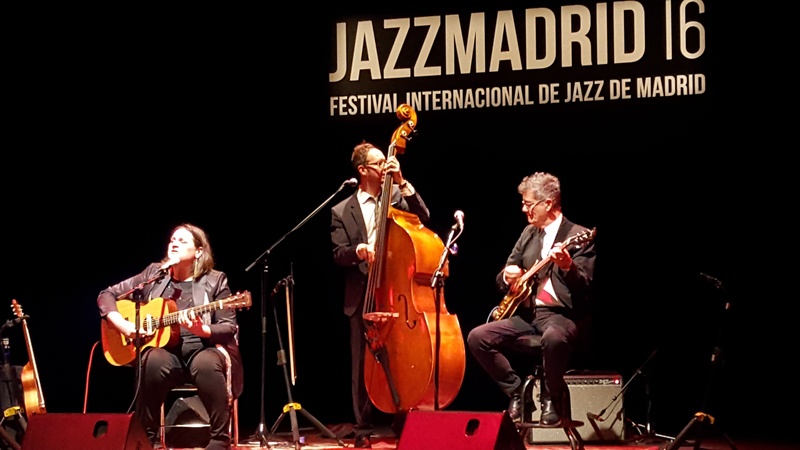 Pablo’s compositions are simply some of the best that jazz / flamenco has to offer and his band is executing them perfectly – with power and feeling! From the various guests especially singer Ganavya Doraiswamy needs to be mentioned with her beautiful performance in VALSE POUR NOOR for which she as well wrote the lyrics. Worth checking out! !